It can be assured that the same Nicoderm funded activists, (American Lung Association, Campaign for Tobacco Free Kids, American Non-Smoker's Rights, etc.) which lobbied for rent seeking smoking ban laws elsewhere; also misinformed Nevada lawmakers that smoking bans were good for business. The headlines though tell a different story. Meanwhile, Johnson & Johnson Company / ALZA, the maker of Nicoderm; and their private foundation (Robert Wood Johnson Foundation) are laughing all the way to the bank. 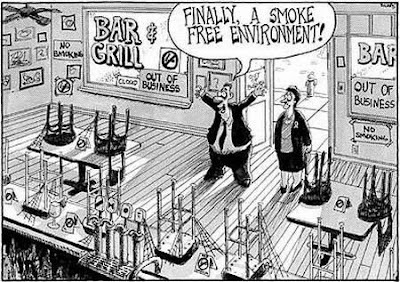 What happens in empty non-smoking establishments affects local businesses, jobs, and the economy. But apparently many lawmakers are too ill-informed to understand basic economics.